From L to R: NSDAR Daniel Boone Chapter Regent Jill Privott, Town of Boone Mayor Rennie Brantz, Dr. Eric Plaag, and NSDAR Daniel Boone Chapter Historic Preservation Committee Chairperson Mary Moretz. Photo courtesy of Ken Ketchie, High Country Press. 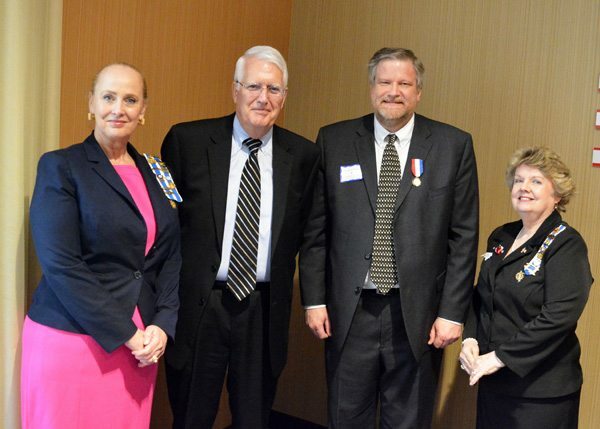 On February 25, 2018, the National Society Daughters of the American Revolution awarded our principal consultant, Dr. Eric Plaag, the NSDAR Historic Preservation Medal. This medal is designed to honor an individual whose volunteer service, promotion, and dedication to historic preservation has made a distinguished contribution on a national, regional, or state level. It is the highest award conferred by the NSDAR for historic preservation. The Daniel Boone Chapter conferred the award to Dr. Plaag at a ceremony in Boone, North Carolina. As part of the reception and ceremony honoring Dr. Plaag, the Boone Town Council and Mayor Rennie Brantz proclaimed February 25, 2018, as Dr. Eric W. Plaag Day in honor of Dr. Plaag's achievements. Full coverage of the event can be found in this article from the High Country Press. First, I am so deeply honored to receive this medal, which was completely unexpected when Mary Moretz and Brenda Councill first delivered the news to me back in December. I’d like to thank the Daniel Boone Chapter of the National Society Daughters of the American Revolution, not only for this recognition but also for the impressive dedication you exhibit in serving our community and its understanding of the past. I’m also very grateful to Mary Moretz for shepherding my nomination through the process and Brenda Councill, Phyllis Shore Baumbaugh, and Jill Privott for their leadership in putting together such an amazing event on my behalf. I am indebted to Chuck Watkins, John Ward, and Bettie Bond, not only for being partners on so many historical projects here in Boone but also for writing testimonials on my behalf for this award. I’m delighted that my dear friend Lawton Clarke O’Cain, who has sent a prodigious amount of work my way over the past ten years, was able to make the long journey from Estill, South Carolina, for this event, along with her friend Sunny, who graciously volunteered to accompany Lawton. I’m also very blessed that my family—my wife Teresa, my brother Gary, and my son Griffin—are here with me today. Thank you to all three of you for listening to me prattle on about local history and keeping our little world running when I’m out trudging through swamps, forests, musky libraries, and old houses. And I’m especially grateful to the members of this and many other communities—academics, writers, genealogists, and just regular old folks, living and dead—who have told me their stories, pointed me to forgotten sources, collaborated with me on projects, and made history more accessible to all of us. I could not do my work without you, and I remember that every single day. Mary Moretz has asked me to say a few words about history, so I’ll begin with a story, as all good histories do. Several years ago, my friend Lawton arranged for me to meet with a highly distinguished scholar of Lowcountry South Carolina history and compare notes on a project I was working on. He was in his late 90s then but still sound of mind and sharp as a tack, his social graces as conservative and rigid as his politics. I confess that I was a little nervous, and he did little to put me at ease when he pulled out his extensive volumes on his matrilineal and patrilineal heritage. “I’ve traced my mother’s side back to Charlemagne,” the good doctor said, “and my father’s side back to Adam.” I thumbed through his genealogies briefly, and indeed they made these claims. “Now, tell me about your people,” he said. I’d been in these kinds of pedigree-measuring contests before, though never with someone so esteemed. I could have gone on about Wernher von Braun being a not-too-distant cousin on my father’s side, or how the Plaags were closely related to Prussian royalty. Instead, I chose to tell the other part of the story. “Excuse me?” the doctor asked. And with that, our conversation moved on swiftly to other topics. I tell you this story to amplify my company’s motto: Preserving Our Past with Integrity. In my case, integrity is represented by the rabid devotion I have to meticulously fighting my way to the truth, the good and the bad of it. Integrity guides everything I have ever done as a historian. So, in practice, what does integrity mean as far our local history? Above all else, it means telling the full story, rather than gussying things up like some sort of slick, misguided PR campaign. It means that it’s completely fine for us to repeat the compelling story about the son of one of Boone’s founders, unarmed and pleading for his life, being gunned down at his barn in March 1865 by marauding Union troops PROVIDED that we also mention that he was standing next to one of the six people enslaved by his father when it happened. It means it’s perfectly appropriate to enumerate the accomplishments of Boone’s business leaders who transformed a sleepy county seat into a bustling commercial center in the mid-1920s PROVIDED that we also talk about the giant Ku Klux Klan festival and parade the town’s civic leaders put on in 1925 and remind ourselves that they actually re-named the second floor meeting space in the old 1875 Courthouse “Ku Klux Klan Hall.” The same rules on integrity apply to architectural preservation, too. Preserving and re-using an intact and historically significant building is noble and admirable, PROVIDED that we don’t exaggerate its importance with patently false and easily debunked claims about its connections to Tweetsie Railroad or Daniel Boone, as has happened repeatedly in our community. Writing good histories and properly preserving our past demands context. We must be skilled weavers of tapestries that are fair, proportionate, exacting, and—yes—critical of ALL parties to the tale. We must be meticulous about getting the facts right, even when it is uncomfortable or costly or dangerous. Anything else is shameless boosterism and humbuggery, no different from the subscription-financed, self-congratulatory Who’s Who histories of yore. Our descendants deserve better than that. When we are honest about our past, we begin to find our humility. And when we find our humility, we begin to find our humanity. Only when we tackle the foibles of our ancestors do we realize that we are no better than our neighbors, regardless of their ethnicity, class, or culture. There but for the grace of God go I, as the old dictum advises, should be the mantra of every historian, professional or layperson, because once we accept that, we can also begin to understand others and relate to them, in spite of our perceived differences. And that’s the whole point. History isn’t supposed to be about justifying our importance in the context of dead relatives we never knew. It’s about understanding others and seeing their experiences honestly, clearly, and purposefully, rather than as some egocentric commentary on ourselves. So, talk freely about the frauds and the socialist labor leaders in your family trees. Celebrate them not by aggrandizing their memories or whitewashing the ugly bits but by being brutally factual and historically accurate about them. Trust me: those difficult relatives are a heckuva lot more honest—and interesting—than the Charlemagnes and the Prussian princes who might be lurking in your lineage. And talking about them will keep you a lot more honest and interesting, too.